On this day in history, November 1, 1765, the Stamp Act of 1765 was to take effect. The protests, rioting, boycotts and threats of the colonists against stamp distributors and customs officials had already taken their toll though. When November 1st arrived, there was not a single stamp distributor left in the colonies who had not resigned his position, with the exception of Georgia's because he did not arrive until January, and he resigned... after one day on the job! The Stamp Act was issued in order to raise funds to help administer the colonies and to pay down the high debt incurred by Britain during the French and Indian War. 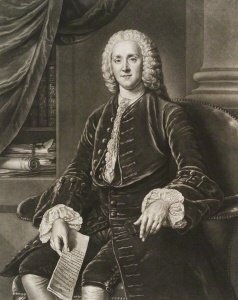 It was the creation of Prime Minister George Grenville who was not particularly favorable to the colonists, who burned up any stamps they could find, boarding ships and storming government buildings to find them. Officials in numerous towns were threatened with their lives if they attempted to enforce the acts. Some were driven from town or into hiding. Others were attacked at home or held at gunpoint until they made an oath that they would not enforce the hated Act. All this pressure, along with an economic boycott of British goods eventually caused Parliament to capitulate. The Act was repealed in March, 1766. Read more about the Stamp Act here. Read the actual text of the Stamp Act here and find the Repeal Act here.